In 1948 Poul Kjaerholm (pronounced cure-holm), completed his training as cabinetmaker and moved to Copenhagen. There, he enrolled in the furniture department of the School of Arts and Craft to prepare for a career as an industrial designer. Coincidentally, his principal instructor at the school was Hans Wegner. After three years of classes, as a graduation project, students were required to design and construct an original piece of furniture. So in 1951, Kjaerholm presented his first piece as a furniture designer as part of this graduation project. He called it the Elementstol or ìElementî chair, as a way to describe a simple object that could be used in a variety of settings. For the Element Chair, he used a bent steel frame wrapped in a halyard line, the braided cord used on sailboats. The really unique part of the Element Chair design was that he started with a single piece of half-inch steel plate, cut out the chair pattern with a metal saw, and then bent into the chair into shape. His intention was to create a chair with a continuous frame that did not require joints or fasteners for connections. 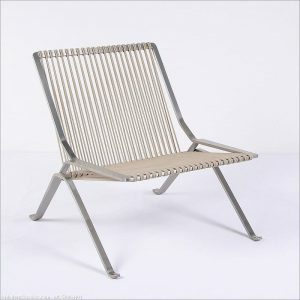 He also drew inspiration Wegnerís Flag Halyard chair of 1950 which used panels of halyard line over a welded frame. For our reproduction of this chair, we were able to duplicate the exact same pattern on stainless steel, cut it with modern laser cutting equipment and bend it using hydraulic brakes. Take a look at this close-up of our reproduction of this chair frame and you can really see how this all comes together. As a metalworker myself for the past 15 years, I have never seen anything like this and think it is absolutely amazing that such a thick piece of steel can be formed in such a way to make legs and a back, without a single weld! You can have a seat and also check out everything else we have by visiting any of our three showroom locations in Bellingham, Chicago or Dallas!